At the onset of our foyer makeover, I knew that one of the most important improvements that I wanted to make was to brighten this dark’ish space. The addition of a painted white board and batten wall has accomplished just that! Take a look at how far this wall has come. …to a finished, caulked, painted and styled wall! I always knew that I would put hooks for coats on the left side of the wall, but struggled with what to do on the right. In the end, I realized that there will be times when we need lots of places to hang coats, so I added them to the right side as well. Pookie helped me build these super simple benches a couple of weeks ago. I’ll be sharing the tutorial soon! You may notice that the fabric is the same as what I used on our chairs in the dining room. Use lots of texture – think baskets, straw hats and grapevine wreaths. Use greenery and/or dried or faux flowers. Add elements of zinc or galvanized metal. Soften things up with fabric – upholstered pieces and pillows. 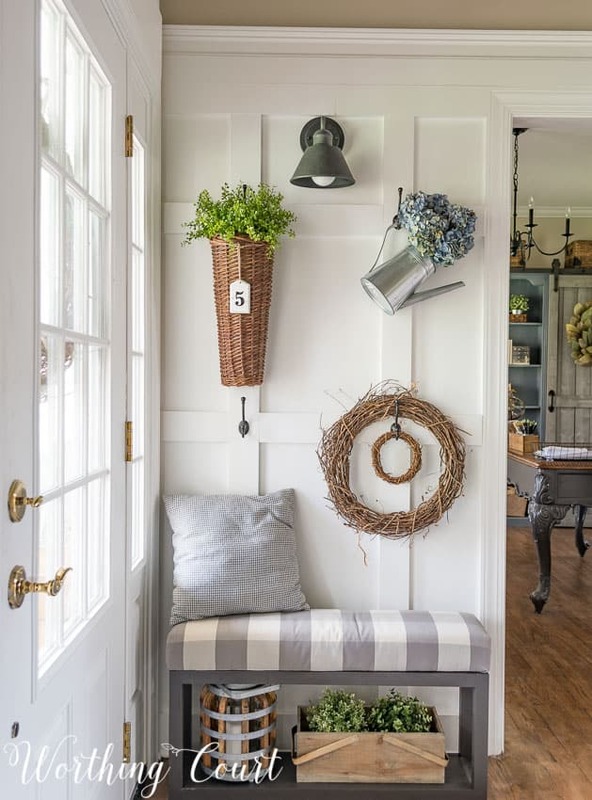 Display your items in unexpected ways on inexpensive black hooks. THESE are my favorite. The best part about this? Everything that I used, with the exception of the benches, came out of my stash! That looks GREAT!! Love it! Really want to do board and batten somewhere in my home. Loving the foyer ideas! You are giving me some wonderful ideas! GREAT job on the benches!!!!! 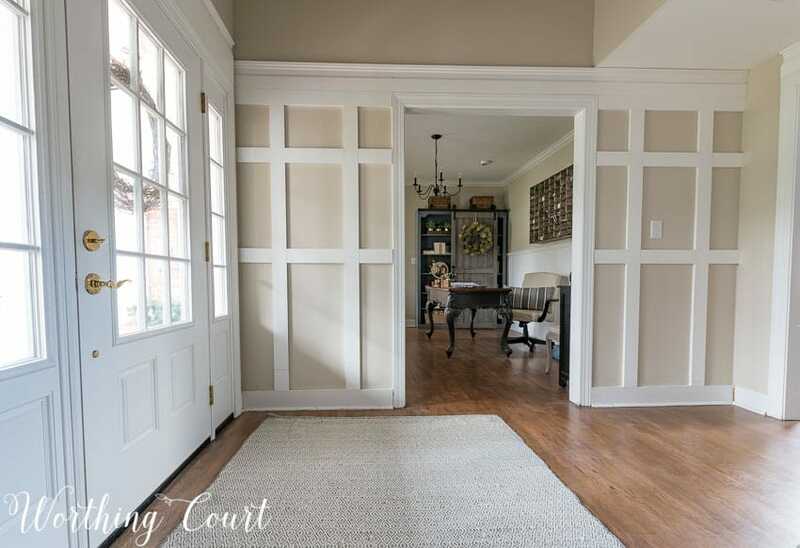 Amazing foyer transformation! 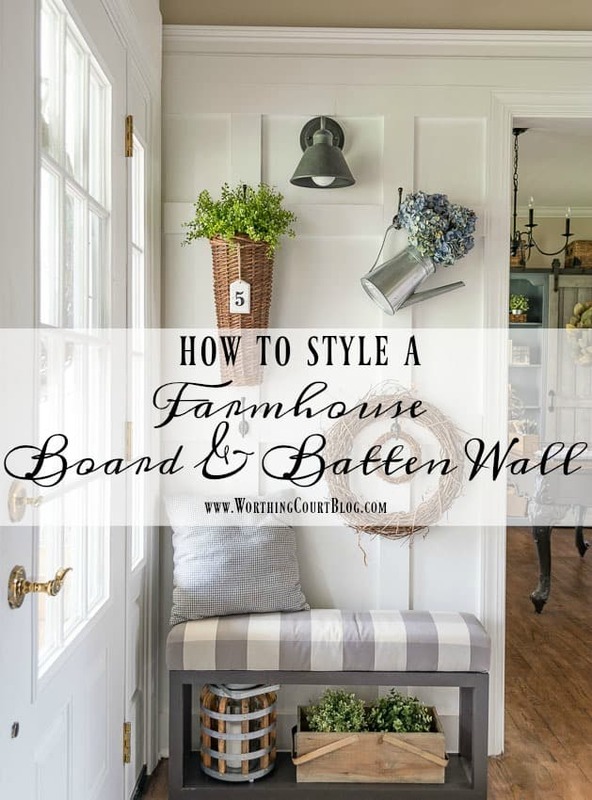 Love board and batten! What a great transformation! Your lighting choice was my favorite of the bunch. I’m looking forward to the bench tutorial! I love the board and batten look. It definitely brightens the foyer. Your choice of lighting is wonderful. I wish I had waited to build a bench. My husband told me he’d do so, but I got a little impatient andI bought one. I love the one I bought, but I’m sure I could have saved a bundle. ? Your foyer looks bright and the those lights are exceptional. What a difference. I also like the benches that you made and the fabric that you used. I wonder where n my home I could do this! The wall looks great! Such a fresh look. Amazing transformation! Now it is decorative and useful! Love what you have done. Looking good! What a beautiful entrance to a beautiful home. It looks fantastic. Love, Love, Love! Can’t wait for the bench tutorial! I love your list! “big honkin wall” that’s how I write lists too!! Looks fantastic and I’ll be waiting on that bench tutorial – they look fantastic!! Wow! Awesome redo! Love it! Oh, this is SO lovely! Are you ready to come help me on my house now? I love the board and batten wall. I’d love to do that in my foyer but it wouldn’t have nearly the impact of yours since it has a dropped ceiling. The look you have put together is just great! The sharp white against your walls looks beautiful! I love the fabric on your benches and chairs! Looks awesome! I’m thinking of doing the board and batten on my closet wall …..someday LOL. Your foyer turned out great. 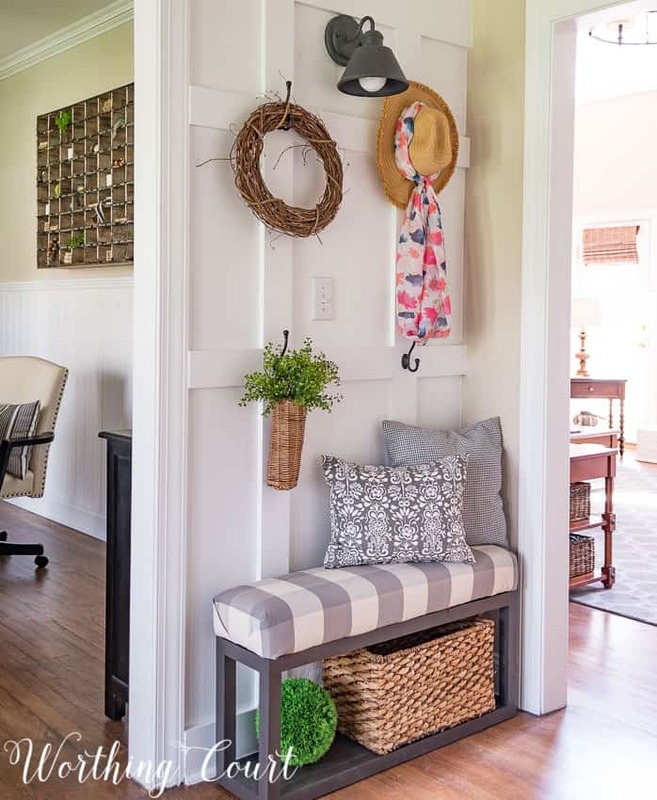 I really like the batten wall (would have never thought of that) and the benches gives it a feel of a room not just a foyer.Great job Suzy, you’re an amazing decorator and I have learned a lot from you. 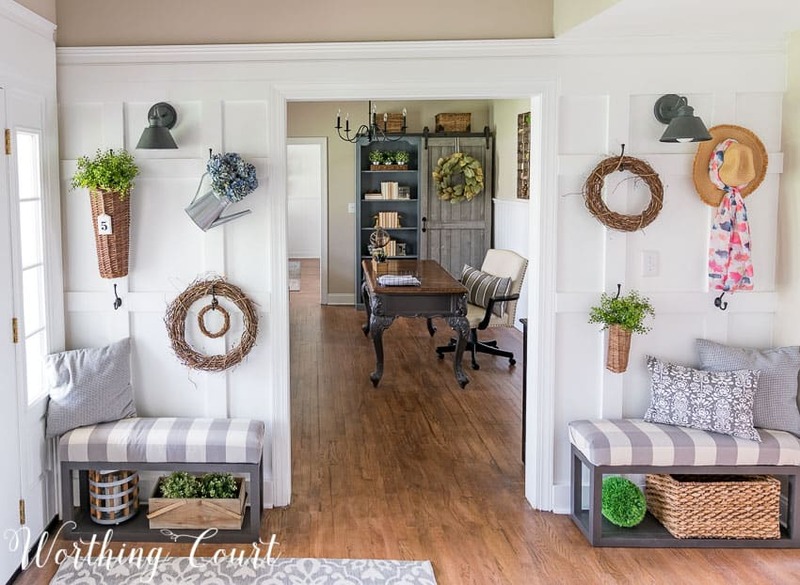 Beautiful foyer – you did well!! Your foyer area is so cute. I really like the light fixtures that you picked out. The foyer is just lovely. Your benches are perfect. Love the buffalo check! I need to go out and buy a few wood working tools and learn how to make not just the benches but other projects as well. You’re never too old to learn. What an amazing transformation, I love using every single ounce of your home and this is a perfect example of how to do that! pinning! I am in LOVE! I looked all over the site for a tutorial of the board and battening. Did you do one or will you be doing one? This is a look I would love to have in my living room. I was wondering how you decided where to divide into the sections? Also can you tell me the paint color you used. Thank you again for sharing. This made my day. Hi Tracy. My method for determining the placement wasn’t very scientific – I held a board up and if that’s what looked good to me, that’s where it went! 😀 Then the exact same spacing was repeated on the second wall. I didn’t take any photos during the process, so I can’d do a full tutorial. I may do a post that includes the sizes of all the boards that we used though. Our walls are painted Sherwin Williams Accessible Beige and all of the white trim, including the entire board and batten wall is painted with Sherwin Williams Extra White. Please do a tutorial on your Board & Batten wall. I have scoured the web and honestly, this is one of the prettiest transformations I’ve seen! Beautiful job! Warm and welcoming – great job! I would love to have the upholstered pieces in my home. they add so much character. I love your “new” entryway! It’s so light and bright and perfect. And I can’t wait until you share your tutorial on those benches! I love your home. It’s beautiful and I love the board batten wall. Thank you for sharing at Dishing it and Digging it link party. We love having you. I wish my foyer would lend itself to being larger so that it would be more inviting like yours. 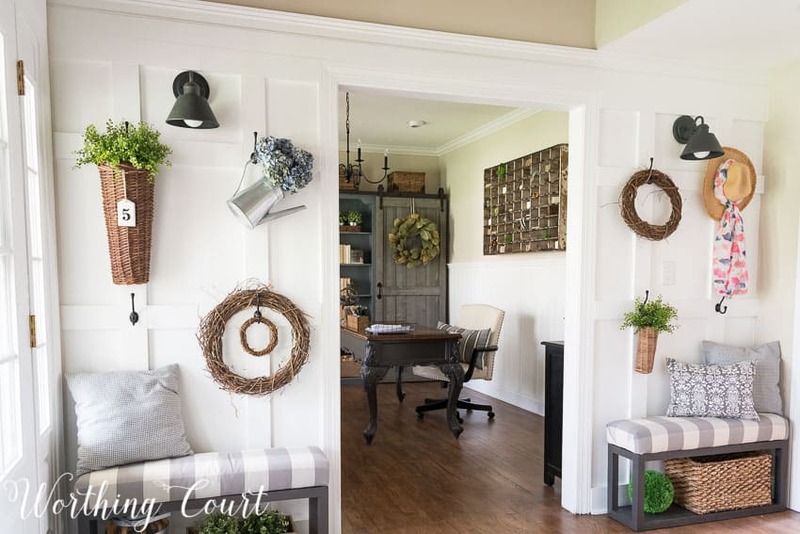 Suzy, Where did you get the wicker baskets that hang n your wall in the foyer area? Hi Gigi. All of my baskets came from local shops. I found this one for you (similar to my long one) on Amazon: http://fave.co/2pKqoCw . It is amazing how much character the board batten adds, yet it is not overpowering. I’m relieved to see you struggle a little with challenges, the ideas of how to decorate don’t always just tumble out by the wheelbarrow full. I love this look and want to try it. Very inviting! 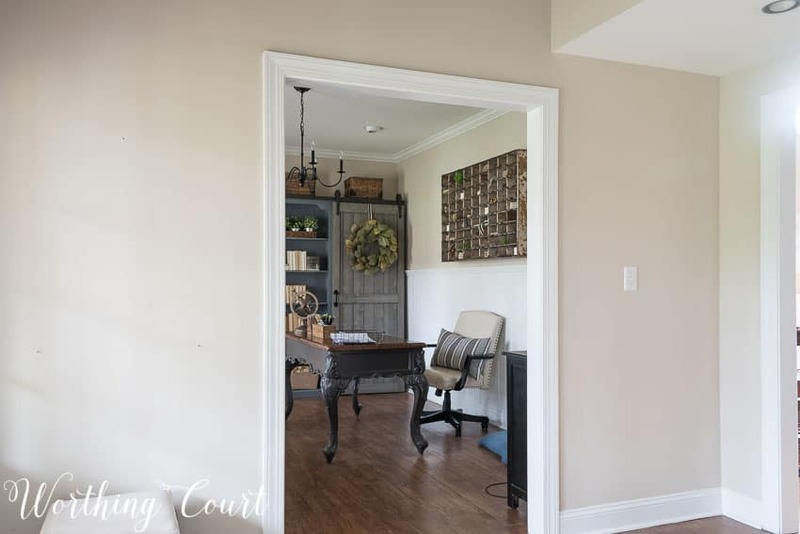 I love the color and wood of your floors in the foyer and office of your Board and Batten Wall area. We are installing new floors, do you know what the product is?